Summary: The length of some audio podcasts are increasing at an alarming rate. Podcasters should learn to master the fine art of editing or risk losing large portions of their listening audience. I provide some helpful tips to help them avoid pitfalls and offer some anecdotal evidence on the subject. Even if you read no further than the above summary, you’ll have a pretty good feel for what this post is about, where it’s going and what will be discussed. Unfortunately, this is more than I can say of many of today’s most popular audio podcasts. I’ve noticed a few alarming habits that podcasters are adopting that have put me, and others like myself, off from listening to their content. By writing about these trends, I hope podcast producers will look at the criticism objectively and perhaps find some room for improvement. Almost a year ago, I started listening to the excellent Mac-based audio podcast by Leo Laporte and company called MacBreak Weekly. MBW is a “round table” discussion between Leo and a cast of regulars including Merlin Mann, Andy Ihnatko and others. I enjoyed MacBreak Weekly for a long time, until I noticed the length of the broadcast kept creeping up and up. The hosts would often wander off on tangents that often had nothing to do with the subject of the discussion. Leo proudly dubbed these tangents “ratholes” and they even came up with a little musical jingle for the things. They were cute at first, but soon grew annoying. When episode number 70 hit 112 minutes back in December, I had had enough. 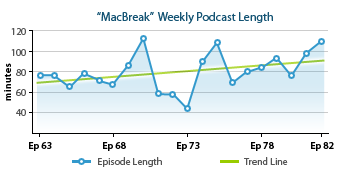 The length of MacBreak Weekly episodes has been rising slowly for some time, and I don’t think they even realize it. I love a good 20 minute discussion about Apple IIc’s as much as the next fanboy, but there are limits. Laporte seems to have forgotten how to edit his podcasts and the result are bloated episodes. In addition, TWiT doesn’t even supply an episode summary until a week after its initial broadcast. Podcaster tip: if you can’t be bothered to listen to your own content and post a detailed summary of what you’ll be talking about for the next 1.5 hours, I can’t be bothered to listen. Can I Buy Shares of GRUBR? Another one of my favorite podcasts is The Talk Show with Dan Benjamin and John Gruber of Daring Fireball fame. 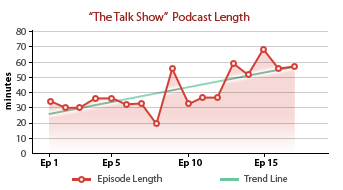 Like MacBreak Weekly, episodes of The Talk Show have been getting longer. Unlike MacBreak Weekly, the creators of The Talk Show are firm believers in editing, which results in more “cake” and less “frosting”. And although the running length is increasing faster than that of MacBreak Weekly, Benjamin & Gruber haven’t yet reached the dreaded average running length of 1.5 – 2 hours that Laporte and company regularly flirt with. Dan Benjamin says that they typically record 1.5 to 2x as much material as they need and then edit out all the non-essential bits to arrive at their final running time. They don’t set a time limit for The Talk Show, but they do make a conscious effort to bring listeners the interesting bits and leave the rest on the cutting room floor. This being said, I still think set running times are a good idea. Podcaster tip: It’s much easier for someone to plan to listen to a podcast from week to week when its length is fixed. A great example of this is NPR’s Wait, Wait, Don’t Tell Me. Each episode is 47 minutes long and so I know exactly where I’ll be when it starts, and when it ends. If you can’t say what you have to say in a set time, consider editing it down or breaking it up into parts. So how long should your average audio podcast be? Not surprisingly if you ask a podcast producer they’ll probably tell you “As long as it needs to be.” Unfortunately this attitude often reflects the desires of the creator and not those of the audience. People’s time is limited and in this modern age, attention spans wane. 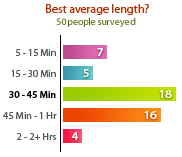 I took an informal survey on Twitter to ask people their thoughts about what was the right length for an audio podcast. Fifty people responded and took the poll. Although the tally can’t be considered scientific by any sense of the word, I believe the results are indicative of your average content consumer. Is it really any wonder that people’s preferred length for a podcast is the same as your average television show? Podcaster tip: When podcasts approach the length of feature films, people start to lose interest. It’s better to break long epics up into short, multiple features. Another portion of the Twitter poll asked respondents where they listen to podcasts the most. A full 46% of them said “On the go” meaning in their cars, while jogging, riding the subway, etc. Sometimes I load up my iPhone with episodes of The Talk Show and listen to them on my morning drive of about 15 minutes. Until the recent spike in length, I was able to get through one episode of TTS in a single day’s commute, which was just perfect. Indeed, the 2005 U.S. census reported that the average American’s commute time to and from work was 25 minutes. Large cities like New York were a bit higher at 38 minutes, but all were under an hour. I think this fact helps explain the audience’s desire for 30-45 minute podcasts. By nature, people love closure and enjoying a podcast that can be completed in a single commute is a satisfying experience. Hat tip to Craig for his help with the graphing portion of this post. Me bad with spreadsheets. Craig good. Great post Ged. Under 20 minutes is too short, in my opinion… if I’m going to bother starting up a podcast, I’d like it to last awhile so I don’t have to go finding something else to listen to right away. 30 – 60 minutes is perfect – any longer and it’s too much of a commitment for a podcast. Great write up here, and the graphs are a nice touch. Personally, I love long podcasts. In fact, I’m often disappointed about the brevity of the podcasts I most enjoy, such as the Official LOST postcast, Radio Lab, etc. I have no problem just hitting Pause when I’m ready to do something else. My iPods and iPhone remember where I left off for me. I also should mention that our last episode was 6 minutes in length. Call us men of extremes if you will. Thanks for the perceptive analysis, Ged. As the host of a somewhat freeform/call-in show, I also feel the duration problem creeping up on us. The challenge in editing down that sort of program is keeping introductions and welcomes intact while losing the dross. Then again, doing the show live means that in some respects we’re not as focused on the after-show listeners as we could be. Yeah it was great except I consider it to be more of a “clip show” as it were. That’s why I didn’t include it in the graph of The Talk Show’s length. If it had been new content and not culled from parts of episode 17 then it would have worked in your favor. I too use the pause button on long podcasts Dan, but when they are going on 1.5-2 hours, and I have to keep coming back to them over and over to get through it, I feel like I’ve been listening for days and not minutes. That’s when I lose patience and say buh-bye. Anyway, thanks for commenting, it’s appreciated. I very much prefer longer podcasts (I’m really digging the expanding MBW) – but this is wholly down to they way I listen. Playing Devil’s advocate as I like to do, radio shows like “Wait, Wait…” and “Science Friday” port over well as podcasts since they need to be of a certain length for the radio. Also, they have experienced editing people to trim as needed (as you know from attending the “Wait, Wait…” taping). Most podcasters are basically running the whole show themselves. Having said that, I usually don’t listen to podcasts that last more than an hour. They tend to ramble on and generally don’t follow a set format. It’s definitely frustrating to listen to them. FWIW, I think most podcasters would appreciate any feedback especially if they’re new to it. Good job, Ged. I’d just ad “Abandon your intro music.” I can’t stand podcasts with intro music that goes on and on. Yes, we all know you have GaraBand with the fun little jingles. Very nice. That’s something I love about The Talk Show. They just start talking from the very first second. Podcasters needn’t use radio or television as models for how a “show” ought to be formatted. I think that’s a difficult realization for a lot of people. Thanks for the post. I create the podcasts for User Interface Engineering. Without sounding like an ad, we have three series of podcasts, one, Userability, is a one-guest call-in show that is about 10 minutes in length. One is the Usability Tools Podcast, in which we attempt to discuss a design method or tool in about 30 mins, and one, the SpoolCast where we interview someone involved in design that’s typically in the 45 minute range. According to our download stats, one length is not preferred more than another (of course, we can’t tell what gets listened to once it’s downloaded), and on-site plays are also pretty equal. We have conducted surveys of our users, and in our case the people are evenly split between hoping each show fits in their average commute (~30) and not caring at all because they just pause and resume later. For the record, I edit every episode extensively, so it’s only as long as it needs to be. But I don’t assign arbitrary time constraints. I think the beauty of podcasting is that it doesn’t have to have arbitrary time constraints. Cover one full topic and stop. Cover three… I don’t think it matters. What matters is that you talk to and please your audience. This is what works for us.